Offering you a complete choice of products which include duct heater and air duct heater. We design and supply of Air Duct heaters for the heating and ventilation industry, manufacturers of air handling units and process ovens. 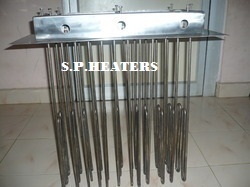 All types of air duct heaters flanged or circular heater and as per customer requirement. · Ranging from 500w to 2000kw. · 500w to 15kw available single phase 240v. · 1.5kW to 90kW available three phase 415V. · Higher power ratings 4-6 weeks delivery. · With terminal enclosures depth 70mm, or stood off terminal enclosures and isolation plugs for high heat applications. · Standard rectangular duct up to 1600mm, Standard Length 300mm in direction of airflow. · Standard circular duct up to 600mm diameter, Standard Length 400mm in direction of airflow. · Standard Length 400mm in direction of airflow. · Stainless Steel 316 or Incoloy 800 elements dependent on the application. · Up to 6 stages available on most heaters, if control is via step rather than thyristor. · Ranging from 500w to 2000w. Looking for Duct heaters ?